The symbol of Mother Nature, abundance, fertility, and wealth, the Empress is often evoked in the image of Ceres/Demeter, the goddess of grain and the seasons. 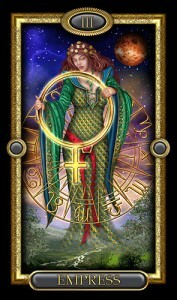 She represents good luck, rich emotions, sensual pleasure and passion, and the thorough enjoyment of “all the things.” Both abundant and practical, she brings light and a thorough grounding in the “real world,” reminding us that life is not all about exploring dreams, intuition and the inner landscapes of the mind. Whether in the realm of money, creative endeavors, or matters of health, consider the Empress pregnant with possibilities. 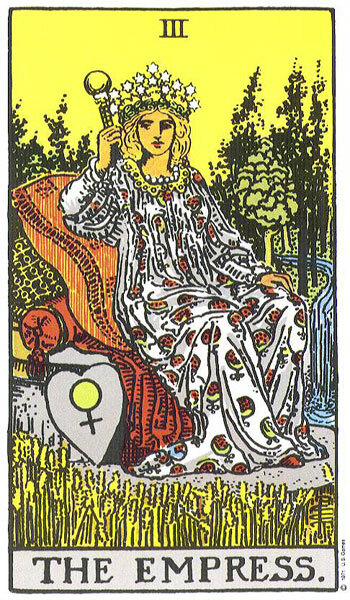 In a reading, drawing the Empress is a signal to rejoice. Your life is swelling with abundance, your environment will become warm and inviting (if it isn’t already) and you are set to enjoy the finer things in life. 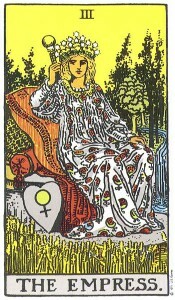 The Empress can symbolize both mother and wife, or someone good with children, or a woman who loves to garden or create. For artists or writers, she doesn’t whisper of good fortune to come, she shouts it with joy.